Salomon August Andrée (18 October 1854, Gränna, Småland – October 1897, Kvitøya, Arctic Norway), during his lifetime most often known as S. A. Andrée, was a Swedish engineer, physicist, aeronaut and polar explorer who died while leading an attempt to reach the Geographic North Pole by hydrogen balloon. The balloon expedition was unsuccessful in reaching the Pole and resulted in the deaths of all three of its participants. Andrée was born in the small town of Gränna, Sweden; he was very close to his mother, especially after the death of his father in 1870. He attended the Royal Institute of Technology in Stockholm and graduated with a degree in mechanical engineering in 1874. In 1876 he went to the Centennial Exposition in Philadelphia, where he was employed as a janitor at the Swedish Pavilion. During his trip to the United States he read a book on trade winds and met the American balloonist John Wise; these encounters initiated his lifelong fascination with balloon travel. He returned to Sweden and opened a machine shop where he worked until 1880; it was less than successful and he soon looked for other employment. From 1880 to 1882 he was an assistant at the Royal Institute of Technology, and in 1882–1883 he participated in a Swedish scientific expedition to Spitsbergen led by Nils Ekholm, where Andrée was responsible for the observations regarding air electricity. From 1885 to his death, he was employed by the Swedish patent office. From 1891 to 1894 he was also a liberal member of the Stockholm city council. As a scientist, Andrée published scientific journals about air electricity, conduction of heat, and inventions. A keen friend of Jonas Patrik Ljungström, he notably educated the former's sons Birger, and Fredrik Ljungström. His view of life was that of the natural sciences, and he entirely lacked interest in art or literature. He was a believer in industrial and technical development, and claimed also that emancipation of women would come as a consequence of technical progress. Supported by the Royal Swedish Academy of Sciences and funded by people like King Oscar II and Alfred Nobel, his polar exploration project was the subject of enormous interest and was seen as a brave and patriotic scheme. 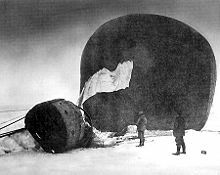 The North Pole expedition made a first attempt to launch the balloon Örnen (The Eagle) in the summer of 1896 from Danes Island, an island in the west of the Svalbard Archipelago, but the winds did not permit the expedition to start. When Andrée next tried, on 11 July 1897, together with his companions engineer Knut Frænkel and photographer Nils Strindberg (a second cousin of playwright August Strindberg), the balloon did set off and sailed for 65 hours. This was not directed flight, however; already at the lift-off the gondola had lost two of the three sliding ropes that were supposed to drag on the ice and thus function as a kind of rudder (this was observed by the ground crew). And within ten hours of lift-off, they were caught by powerful winds from a storm raging in the area. The heavy winds continued and, together with the rain creating ice on the balloon, impeded the flight. It is likely that Andrée realized before the flight ended that they would never come near the pole. For these reasons, they were forced down onto the ice, though the landing was conducted in a semi-controlled way rather than actually crashing. They had covered 295 miles (475 km) and floundered on the pack ice. The expedition was well equipped for travelling on the ice (three sledges and a boat) and had supplies for three months; also there were three deposits in northern Svalbard and one in Franz Josef Land. They set off eastbound for the latter, but after a week they had moved west due to the currents which moved the ice. They then changed direction towards northern Svalbard; movement was slowed down by ice drift and by the craggy surface of the pack ice. The three had to pull the sledges themselves, and despite good reserves of food, added to by their shooting polar bears, the efforts against the moving, uneven ice wore them out. They reached land in early October after over two months on the ice, setting foot on Kvitøya (White Island), just east of Svalbard. They perished there, probably within two weeks after landfall. Most modern writers agree that Nils Strindberg died within a week of arrival: he was buried among the rocks (though no marker was placed on his grave) while the other two men were later found in the tent. Diary notes and observations end just a few days after they landed on Kvitøya; up to that point these had been kept up even in hard conditions; this seems to indicate that something critical happened after a few days. It is likely that Strindberg met his end at this point. It has not been possible to establish the reason for his death. Suicide (which would have been possible with opium) is very unlikely in his case even though by this time all three no doubt realized they would die. Whatever Strindberg might have felt about the outcome of the expedition, it is near certain that he would have judged the option of suicide as treachery to his fellow explorers. The diary notes of the expedition indicate that all three men were sometimes plagued by digestive trouble, illness and exhaustion during the trek over the sea ice. The ultimate cause of death probably had something to do with the ingestion of polar bear flesh carrying Trichinella parasites, which were found in the remains of a polar bear on the spot examined by the Danish physician Ernst Tryde and published in a book in 1952 called "The Dead on White Island". There is no doubt that the men became infected at some point during the ice trek, though the exact time span is unclear (and this matters because humans normally develop immunity to trichinosis if they survive the first wave of infection). When they arrived at White Island they were suffering from recurrent diarrhea. A plausible indication of this is that some of the provisions they brought ashore (obviously after a few days of scouting to the west) were unloaded and left near the water and not carried to a safer place near the camp. In contrast, Arctic explorer Vilhjalmur Stefansson theorized in his book 'Unsolved Mysteries of the Arctic' that Nils Strindberg probably had died while chasing a polar bear, perhaps from drowning, and Andrée and Frænkel had asphyxiated on carbon monoxide from a malfunctioning stove while cooking in their tent. To account for the unburned amount of fuel in the stove Stefansson referred to his own experience with malfunctioning stoves that required regular pumping up to keep burning. In his opinion they had not lost hope of getting back, but they had made many mistakes and would have died of something else if they hadn't died when they did. Until Andrée's last camp was found in 1930, what could have happened to the expedition was the subject of myth and rumours. In 1898, eleven months after Andrée's first sighting of White Island (which he called New Iceland) a Swedish polar expedition led by A. G. Nathorst was passing by just 1 km offshore from the camp, but the weather stopped them from getting ashore. Already around this time, it was noticed that a heavy storm had been raging and that the expedition had lost the steering lines at departure, and experienced polar explorers surmised already before 1930 that the expedition couldn't have got very far and had likely been forced down on the ice. Finally the remains of the three men were found in 1930 by the Norwegian Bratvaag Expedition which picked up remains including two bodies. A month later the ship M/K Isbjørn, hired by a newspaper, made additional finds, among them the third body. Notebooks, diaries, photographic negatives, the boat and many utensils and other objects were recovered. The homecoming of the bodies of Andrée and his colleagues Strindberg and Frænkel was a grand event. King Gustaf V delivered an oration, and the explorers received a funeral with great honors. The three explorers were cremated and their ashes interred together at the cemetery Norra begravningsplatsen in Stockholm. Starting in the 1960s, Andrée's status as a national hero has become questioned and a cooler, more skeptic view began to prevail, in a way not unlike the changing assessment of Robert Falcon Scott's South polar journey. The emphasis has turned to the fact that the expedition was bound to fail, and that Andrée obviously refused to take in information that questioned the expedition's feasibility (and also had meagre actual flight experience with large balloons, and none in Arctic conditions). Andrée has been seen as a manipulator of the national emotions of his age, bringing a meaningless death on himself and his two companions. Several modern writers, following Per Olof Sundman's Andrée portrait in the semidocumentary novel Flight of the Eagle ("Ingenjör Andrées luftfärd", 1967), have speculated that Andrée, by the time of the departure for Svalbard in 1897, had become the prisoner of his own successful funding campaign and the excited national feelings, and was now incapable of backing out or admitting weaknesses in the plans in front of the press. Andrée Land in Greenland was named after him by Swedish Arctic explorer A.G. Nathorst. The Italian poet Giovanni Pascoli wrote a poem about Andrée's expedition and death. Andrée's writings were adapted into the song cycle The Andrée Expedition by the American composer Dominick Argento, written for the Swedish baritone Håkan Hagegård. Swedish composer Klas Torstensson's opera "Expeditionen" (1994–99) is also based on Andrée's story. 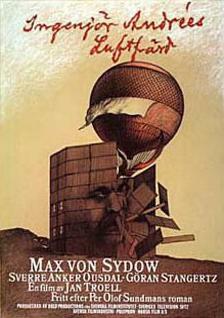 In 1982, the Swedish filmmaker Jan Troell directed a film based on Sundman's book, Flight of the Eagle. In 2010, the American rock group Brian's Escape created a seven-track concept album inspired by Andrée's adventures entitled The Journey: An Account of S. A. Andrée's Arctic Expedition of 1897. The 2010 novel Strindberg's Star by Swedish writer Jan Wallentin revolves around the story of the expedition. The explorers reportedly found two relics which opened a portal to the Norse underworld and set off a chain of events connecting both world wars and the modern day with ancient Norse myths. In 2012, English band The Greenland Choir included a song Reindeer, 1897 on their E.P. Here we are, wandering around like ghosts, which was inspired by Andrée. In 2013, UK/ Norway theatre company New International Encounter (NIE) created a show charting the story of the ice balloon in co-production with The North Wall Oxford and The Key Theatre. North North North premiered at The Key Theatre, Peterborough on May 9, 2013 and toured across the UK and internationally. A 2013 novel Expeditionen : min kärlekshistoria by Swedish writer Bea Uusma retells the story from the point of view of Strindberg's love for his fiancée, Anna Charlier. ^ Wilkinson, Alec. "The Ice Balloon", The New Yorker. April 19, 2010. p39. ^ "Lesson Learned: Don't Fly To North Pole In A Balloon". NPR. Retrieved 2012-01-21. ^ Per-Johan Östberg, Tolkning, förståelse, vetande (Interpretation; understanding, knowledge), Stockholm 1979, p.116 - the book makes a long and rigorous analysis of the written and physical traces of the Andrée expedition and how these may be harnessed in rational interpretation of the course of the journey. ^ See Kjellström, p. 45, and Lundström, pp. 69–73. ^ "Catalogue of place names in northern East Greenland". Geological Survey of Denmark. Retrieved 7 July 2016. ^ "Odi e Inni". Archived from the original on 2012-03-31. ^ "The Journey: An Account of S. A. Andrée's Arctic Expedition of 1897". The Journey. Brian's Escape. Retrieved 25 July 2011. ^ "Here we are, wandering around like ghosts". (in Swedish) Ahlman, Axel (1928) Isviddernas hjältar (Heroes of the realm of ice), ed. Gleerup, Lund, Sweden - popular book on polar expeditions; the author had long experience of treks in the Arctic ocean and makes a detailed analysis of what might have happened to Andrée. (in Swedish) Andrée, S.A., Fraenkel, K and Strindberg, N. (1930), Med Örnen mot polen (With the Eagle towards the pole) ed. Bonniers, Stockholm - original chronicle and publication of the diaries and notes of the expedition, and some of its photographs. (in Swedish) Kjellström, Rolf (1999). "Andrée-expeditionen och dess undergång: tolkning nu och då", in The Centennial of S.A. Andrée's North Pole Expedition: Proceedings of a Conference on S.A. Andrée and the Agenda for Social Science research of the Polar Regions, ed. Urban Wråkberg. Stockholm: Center for History of Science, Royal Swedish Academy of Sciences. (in Swedish) Lundström, Sven (1997). "Vår position är ej synnerligen god..." Andréexpeditionen i svart och vitt. Borås: Carlssons förlag. Lundström is the curator of the Andreexpedition Polarcenter in Gränna, Sweden. This museum has been mainly dedicated to Andrées polar expedition. Sollinger, Guenther (2005), S.A. Andree: The Beginning of Polar Aviation 1895-1897. Moscow. Russian Academy of Sciences. Sollinger, Guenther (2005), S.A. Andree and Aeronautics: An Annotated Bibliography. Moscow. Russian Academy of Sciences. Wikisource has the text of the 1911 Encyclopædia Britannica article Andrée, Salomon August. Dr Alfred Gabriel Nathorst HFRSE FLS FGS was a Swedish Arctic explorer, geologist and palaeobotanist. Flight of the Eagle is a Swedish biographical drama film which was released to cinemas in Sweden on 26 August 1982, directed by Jan Troell, based on Per Olof Sundman's novelization of the true story of S. A. Andrée's Arctic balloon expedition of 1897, an ill-fated effort to reach the North Pole in which all three expedition members perished. The film stars Max von Sydow as S.A. Andrée, Sverre Anker Ousdal as Knut Frænkel and Göran Stangertz as Nils Strindberg. Dutch-Swedish songwriter Cornelis Vreeswijk plays the role of the journalist Lundström. Kvitøya is an island in the Svalbard archipelago in the Arctic Ocean, with an area of 682 square kilometres (263 sq mi). It is the easternmost part of the Kingdom of Norway. The closest Russian Arctic possession, Victoria Island, lies only 62 kilometres (39 mi) to the east of Kvitøya. Knut Hjalmar Ferdinand Frænkel was a Swedish engineer and arctic explorer who perished in the Arctic balloon expedition of 1897 of S. A. Andrée in 1897. Danes Island is an island in Norway's Svalbard archipelago in the Arctic Ocean. It lies just off the northwest coast of Spitsbergen, the largest island in the archipelago, near to Magdalenefjorden. Just to the north lies Amsterdam Island. Like many of Svalbard's islands, Danes Island is uninhabited. The island has an area of 40.6 km2 (15.7 sq mi). Nils Gustaf Ekholm was a Swedish meteorologist who led a Swedish geophysical expedition to Spitsbergen in 1882–1883. Andrée Land is a peninsula in King Christian X Land, East Greenland that is bounded by Kejser Franz Joseph Fjord, Isfjord and Geologfjord. Anna Albertina Constantia Charlier (/'ʃaljə/) ) was a Swedish woman, today most commonly remembered as the fiancée of Nils Strindberg, participant in the North Pole expedition of S. A. Andrée in 1897. Gustaf Vilhelm Emanuel Swedenborg son of lieutenant colonel Gustaf Erik Oscar Swedenborg and Maria Therése Fock, was a member of the Swedish military and an aeronaut, today remembered as a reservist on Salomon August Andrées failed Northpole-expedition in 1897 and for being one of the first Swedish balloonists. He was also the first person to hold an aeronautical certificate in Sweden, issued in 1905. Nordaust-Svalbard Nature Reserve is located in the north-eastern part of the Svalbard archipelago in Norway. The nature reserve covers all of Nordaustlandet, Kong Karls Land, Kvitøya, Sjuøyane, Storøya, Lågøya, Wilhelm Island, Wahlbergøya and a small section of the north-east corner of Spitsbergen. The reserve is 55,354 square kilometres (21,372 sq mi), of which 18,663 square kilometres (7,206 sq mi) is on land and 36,691 square kilometres (14,166 sq mi) is on water—making it the largest preserved area in Norway. It includes the largest glacier in Norway, Austfonna, as well as Vestfonna and parts of Olav V Land. The reserve has been protected since 1 July 1973 and borders in the south to Søraust-Svalbard Nature Reserve. Norra begravningsplatsen, literally "The Northern Cemetery" in Swedish, is a major cemetery of the Stockholm urban area, located in Solna Municipality. Inaugurated on 9 June 1827, it is the burial site for a number of Swedish notables.